The next logical step in your build will be to build your solution or projects. I will guide you how to do it via MSBuild as build engine and NuGet for downloading the necessary packages. In my previous article, “Getting Started with Jenkins and GitHub”, I showed you how to create your first Jenkins job and download the source of your project from GitHub. If your projects are stored in TFS, you can read how to setup your Jenkins job for TFS here: “Integrate Jenkins with Team Foundation Server“. The next logical step in your build will be to build your solution or projects. I will guide you how to do it via MSBuild as build engine and NuGet for downloading the necessary packages. Install the MSBuild Plug-in – This plugin makes it possible to build a Visual Studio project (.proj) and solution files (.sln). In Command Line Arguments – you can enter msbuild.exe arguments that you use when you build your project though command line. For example /p:Configuration=Release is going to build your project in Release mode. Or you can increase the logging verbosity, etc. In order to restore NuGet packages, you have a couple of options. You can try some of the available plugins. However, my preferred approach is to use Windows batch command. First, you need to download the NuGet.exe which you are going to use for the operation. You need to paste a command like the following in the Command text box: “C:\J\Nuget\NuGet_2.81.exe restore “C:\J\jobs\PhantomTube\workspace\PhantomTube\PhantomTube.sln“”. The step should be moved above the MSBuild step because in order for the build to be successful, you are going to need all package downloaded beforehand. Now you are ready to test your setup. Open your job from the link listed on the main Jenkins page. Click the Build Now button. If you open the console output, you can check the status of your build. The post - Integrate Jenkins with MSBuild and NuGet appeared first on Automate The Planet. Of all the options i have googled, this is the only thing worked and helped my day! I dont know why MS BUILD would not do the same thing like the VS builds are. but anyways, thanks! 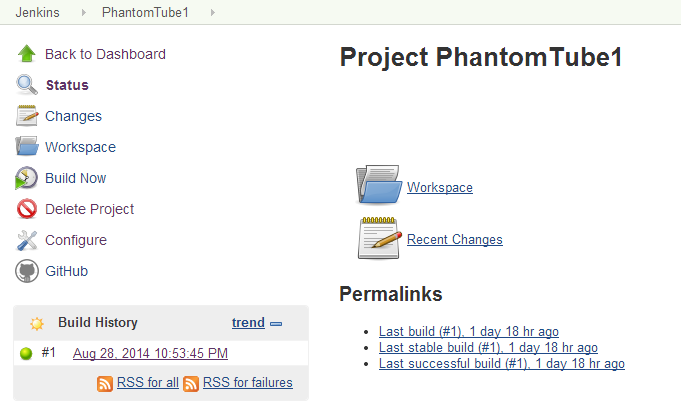 Hi, I am facing issue in my jenkins buils can you please me out....! While I am trying to build i am getting this error, If I delete PrecompiledWeb folder it is successfully. If we build the application with existence PrecompiledWeb folder then again its generating the error. Please help me out bro !! Nuget From a Batch? Your Favorite. How does this update .csproj Hintpaths? 1) the Repository path is set Relative to the Location of the NuGet.Config being used. We use the same nuGet.Config for every sln. We have 100's of slns pointing to that same nuget.Config. We carefully checked this in at a higher level than all of the slns. Please observe this causes an efficient use nuget resources and our network. They are downloaded only once or so. Many of our solutions have use of same packages from nuget. NuGet isn't forced to re-download. Works perfect from VStudio 2013/15 IDE. The challenge is to get this to work from jenkins. 2) For each csproj in the sln the repository path is set and the hint path for each of our dependent packages is restored. 3) Voila it seems an efficient strategy. Our developers are using that effectively on their checkouts no matter what folder or drive they checkout to. We are facing a nuget problem in the Jenkins space. MSBuild from cmd line is next step. I am assuming MSBUILD will do a restore of the Nuget packages (if needed) and update the hintpaths of each csproj. So I am unclear how an isolated Batch file would perform the updating of the hint paths for each of the csprojs in the next step build command that you are recommending. You could add few more options for "Command Line Arguments" and it would have been great. After install of the msbuild plugin I could not find any reference to msbuild in the System configuration area. Sorry for my late reply. Did you manage to resolve the issue? I am not seeing MSBuild option under Configure systems page ? Can you please suggest workaround ? Your comment about newer versions of Nuget not working is not correct. I downloaded Nuget 3.3 and was able to restore without any issues. Other than that, GREAT article. Thanks. Thank you for the feedback, I will definitely update the article. Are you sure that "the newest versions don’t support the restore command"? The newest versions don’t support the restore command so you need to download a version that supports it. My preferred for the moment is 2.81.